Gateway to over 87 FLAAR reports by Nicholas Hellmuth on wide format inkjet printers, inkjet media, RIPs, scanners, professional and pro-sumer digital cameras and digital studio photography. Water-based resin inks are now replacing solvent ink. By 2011 aqueous resin inks will take market share even from UV-cured ink flatbed printers. By DRUPA 2012 we predict that Sepiax and comparable water-based resin inks will be outselling HP latex inks. Why? and how? Gateway to library of over 250 helpful reports by Nicholas Hellmuth and FLAAR staff on wide format inkjet printers, inkjet media, RIPs. We cover the entire workflow: from scanning through to finishing (cutting, coating, laminating). We visited Halls 1, 2, 3, 4, 5, and 6, plus the expanded hall “Nh” (North Hall). The Nh has added several new exhibitors and for 2017 is more than just textile printers (though still has a textile focus). Hall 2 is solid wide-format inkjet printers and lots of desktop inkjet-printers, plus cutters and some media. Most printable substrates are in Hall 4, along with many ink companies. Hall 3 also has lots and lots of booths of media and other printable substrates, plus textile printers, UV-curing printers and more. EFI VUTEk, dilli, AGFA, Swissqprint, Mimaki, etc are here, as are ink books: Jetbest, SamInk, Nazdar and many more. Great expo and this was yesterday, the day before it opens. Today is the first of four days and fortunately there are six of us flown here, so we can cover the frankly remarkable diversity of products (plus signage per se in Halls 5 and 6). Saw an especially nice exhibit of deep relief lenticular prints in Hall 3. Dr Nicholas plus Flor de Maria Setina will be compling a complete list of everything 3D at APPPEXPO. The largest sign and printer expo in the Middle East will be 15 through 17 January, 2017, in the Dubai World Trade Center. Halls 4, 5, 6, 7, and 8. Dr Nicholas and FLAAR video director Erick Flores will both be attending. This is the 20th anniversary so we look forward to seeing lots of printers, inks, traditional signage, and diverse other products which are worth learning about. Visit www.SignMiddleEast.com for more information. Dr Nicholas will be either lecturing or on a panel every day (all three days) of FESPA Africa (September 7, 8, and 9). Toner-based and inkjet desktop and office printers (Xerox, OKI, Canon Oce, plus any comparable brands which have a booth at co-located Africa Print). A week later, three of us from FLAAR will be at SGIA printer and signage expo in Las Vegas, USA. 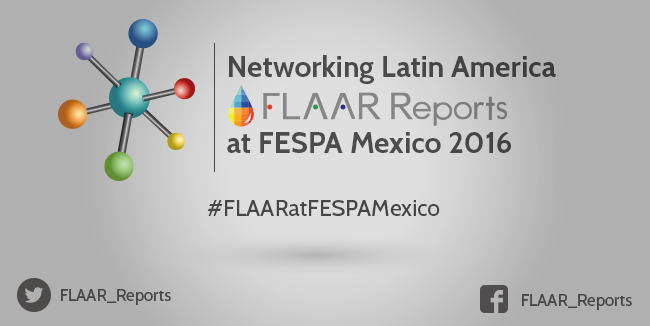 Two members from FLAAR staff will attend FESPA Mexico 2016 on late August. There will be FLAAR Reports based on what we find at the exhibition. If you are interested in consulting write FrontDesk “at” FLAAR.org or if you wish to order any of the upcoming FLAAR Reports. 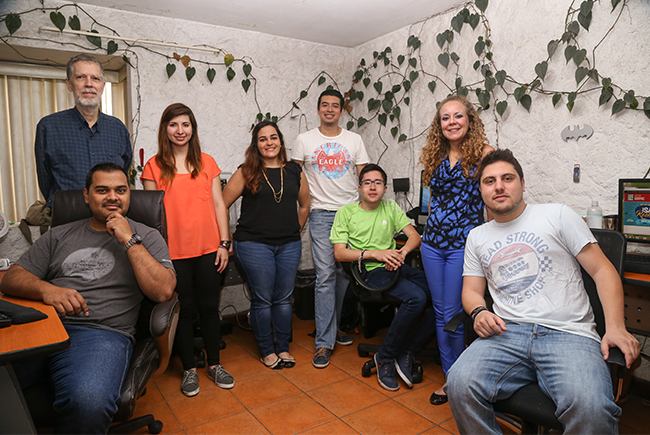 Our team is ready to meet you in Orlando at ISA 2016. Lots to see here at ISA: printers (UV-cured, textile, solvent, latex, water-based), inks, media & substrates, cutters, laminators, RIP software, color management. It would be nice to see more evidence of 3D applications. Sign Istanbul in Turkey had an entire area for 3D printers. But even if there are not 3D “printers” we at FLAAR have written articles on how you can accomplish impressive 3D signage with a UV-cured printer and a flatbed cutter (helps to have a good graphic designer and copies of the FLAAR Reports to show examples. We hope to see you at ISA, including in our FLAAR Reports booth, 1889. FIVE of us will attend APPPEXPO 2016 in Shanghai. Yes, this printer & signage trade show has an exhibitor list big enough that we fly five FLAAR Reports evaluators to China. Hundreds of brands of printers, HUNDREDS. Hundreds of brands of media and substrates. Where else do you find this many opportunities (other than in smoke-and-mirrors PR releases by people who don’t attend expos around the world so they don’t actually know where are the best expos to attend). Plus Shanghai is a beautiful peaceful city, so worth taking your employees (and your family) to visit. March 9, 10, 11, and 12, 2016. Dr Nicholas Hellmuth will be giving two lectures in Spanish and one in English. If you wish these for your company OpenHouse, or for your booth or company event at any other trade show, anywhere in the world, you can fly Dr Nicholas there (naturally all three lectures can be in English; or you can pick another topic). We hope to see you in Miami at Graphics of the Americas: we fly there every year for many years. 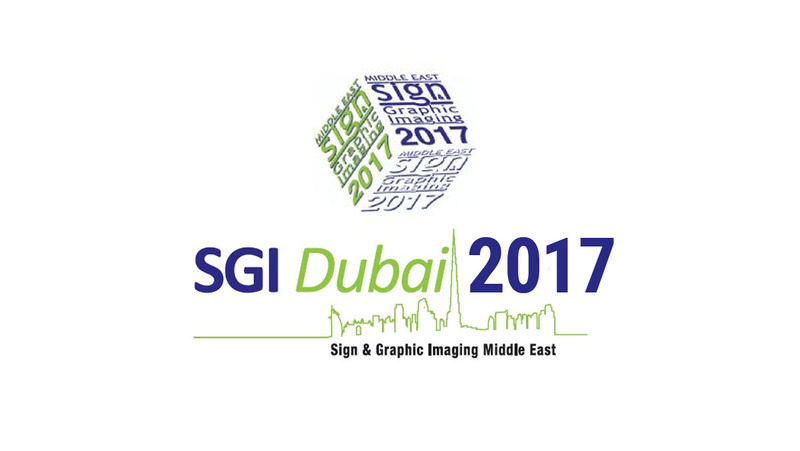 Two of us were in Dubai to attend SGI 2016, Sign & Graphics Imaging Middle East. We will be issuing the FLAAR Reports this coming week. This year FESPA AFRICA was late July, so no more competition with APPPEXPO (which actually in 2015 moved from early July to several months earlier). 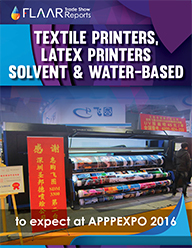 In 2014 FESPA Africa and APPPEXPO were the same week. 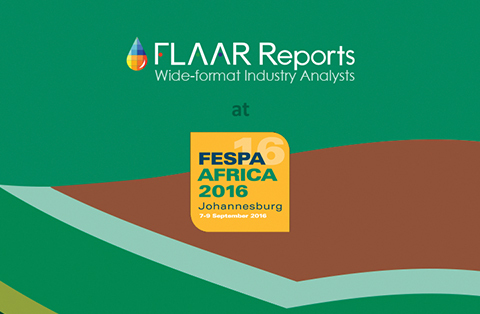 So now FLAAR is back at FESPA Africa. We like this expo for several reasons. It is organized by the same team that do the leading printer trade magazine for this part of the world. Plus the expo is co-located with a sign show, with an LED expo, and with AFRICA PRINT (which means toner-based printers and many other related equipment). We at FLAAR like to see toner-based brands; it is sad that so many "inkjet" or "sign" expos don't have adequate diversity to also feature toner-based office printers. Dr Hellmuth was at these co-located trade shows in Johannesburg July 22 through 24, 2015. 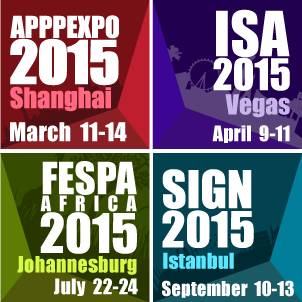 You can subscribe now to obtain our new FESPA Africa 2015 report. How to decide which trade shows to attend? We recommend: at least one of the good printer and signage expos in the USA (we attend four, and two are really worthwhile, but we attend three to four every year to be sure we keep track of all new inks, printers, etc). It is crucial to attend one of the best printer expos in Europe because the key European companies have their full staff only at these expos (at an expo in North America you may only see their local sales repos). It is also essential to attend the best local or regional expo in your area: FESPA Africa would be an example for South Africa. SGI (aka Sign Middle East for the Middle East, etc). Using this formula (one in USA, one in EU, and the best local regional expo close to your home base) we recommend FESPA 2015 in Cologne, FESPA Mexico 2015 in Mexico City, and FESPA Africa (was Sign Africa for many years). Our experience over fifteen years is that print shop owners and managers, distributors, and manufacturers should visit the leading expos in their own home country, the leading expo of printers & signage in Europe, and the gigantic APPPEXPO in China (which for printers, inks, and media is larger than all other expos in the world put together including DRUPA). For people in North America (Canada, USA, and Mexico should attend the big international expos in this part of the world (yes, geographically Mexico is part of North America down to its Isthmus of Tehuantepc). 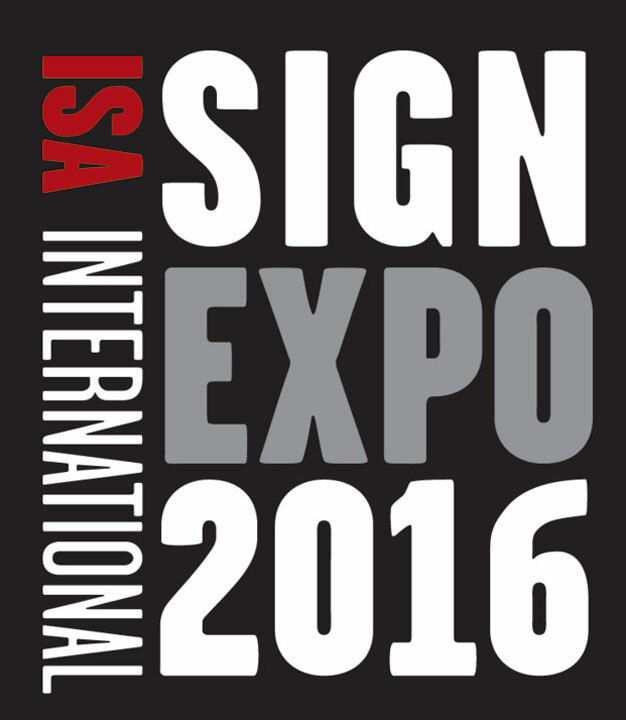 ISA is the first large wide-format-printer and signage expo for North America, so we recommend you attend. Five of us from FLAAR flew there since the expo opened last April 9th, in Las Vegas. We hope we have seen you there, at our booth #416, though the team of Dr Nicholas Hellmuth were out in the aisles evaluating inks, media, printers, software, laminators, coaters, and cutters. Every single year, since D-PES first started in Dongguan, FLAAR Reports has helped provide information about printer expos to our growing list of readers. D-PES has moved to Guangzhou already several years ago, and for 2015 was very different than in past years. It was important to see, in-person, all the changes, so FLAAR Reports attended D-PES.